When any number begins appearing in your life, particularly in odd places, it may make you wonder. What does 44 mean, for example? What is the symbolism of the number 44 and is it telling me something important? If you are asking these questions, you are on the right track. Read on to find out more about the meaning of 44 when it beings appearing to you! Numbers are a part of the Universe’s code book, especially when used by Spirits and Angels. Seeing 44 is an excellent omen. You are building a foundation that will last long into your future. 44 represents discipline, realism, pragmatics and efficient approaches to life’s diverse situations and questions. In Jewish tradition, 44 candles burn throughout Hanukkah. The word Hanukkah means dedication, so the connection to commitment and faithfulness certainly maintains continuity. Scientifically, the element of Ruthenium bears the atomic number 44. Ruthenium is a transition metal and very rare. It’s used in electrical contacts and resistors to deter wear. It’s also a catalyst. In this circle of thought, we can consider 44 an agent of change, uniqueness, and protection. Repeatedly seeing 44 stresses its importance at this moment. 44 is dynamic and expresses the power of possibilities. Take a look around and see if options are presenting themselves that you might have missed. Angels use numeric symbols of one way of telling us they’re nearby offering assistance. The Angel Number 44 means that your Divine allies are helping you in actualizing something really important to you emotionally. Because you feel so deeply on this subject, the Angels stress keeping yourself in balance and focused. Fulfillment comes at a steady, reliable pace and your passion keeps the energy flowing. If there are people or situations blocking realization of this goal, you have to remove those hindrances (or, go around them); this is one of the hardest parts of seeing Angel Number 44. Releasing yourself from sticky situations isn’t typically easy. Your Angels, however, guides you in the best way to broach this without hurting anyone including yourself. They are also telling you to listen to your intuition when communicating about this matter. Angel Number 44 means that the energetic level of support you are receiving from the Universe right now is at an apogee like nothing you’ve ever experienced. Beyond that, those vibrations are attracting a wonderful circle of people that share your ideas, likes, and dislikes; this is like a balm to your soul. It is just what the doctor ordered for wholeness. This group of individuals, working together, will create wonders. In asking what the Angel Number 44 means to you more personally, the answer is working toward or continuing a healthy lifestyle. Don’t overwork, as is often your tendency. It’s not simply ok to say “yes” to yourself, but it’s vital. Sometimes Angels show the number 44 to those with innate healing ability. Perhaps you simply know when a part of someone’s body is damaged. Perhaps you help people get rid of headaches through touch. Healing arts are very diverse so let your Angels guide you in examining this part of your life, finding the best way of expressing your gifts and watching them blossom. As you begin seeing 44 in the oddest of places, it means that a little bit of luck is on the horizon. Additionally, those issues that have laid heavy on your heart in meditation or prayer will begin resolving. The Universe has heard you, seen your struggle, and now everything is in place to receive your answers. We often talk about Divine blessings, but when they actually happen to us in prominent ways, it dramatically changes our outlooks. You can know that you are on the right path and doing the right things. You are living with a fitting purpose, elevated thoughts, and reverent attitudes. This period in your life only accentuates all that. It’s now perfectly clear to see the Sacred in even the tiniest of things. Everyone has down days. When you feel your heart sinking your guides and guardians want you to know that you have love and support. They hover nearby directing optimism and cheer into your aura. It won’t take long for clearing those dark clouds with that kind of Celestial assistance. Those struggling with finances will welcome the appearance of 44 in their lives. Money matters are about to improve. While this seems like a material matter, that relief means you can focus back on matters of spirit with less distraction and worry. Use the abundance that comes your way wisely. Give some to those in need; put some away for those rainy days and then give thanks. Overall the next 44 days will be filled with symbolism and messages that you should take to heart. Remember that you are a worthy individual – worthy of love, of goodness, of kindness … of all good things. As your dreams find a foothold in reality, bear in mind that you played a vital role in all this. Guides and teachers can only take us so far. We always have to walk that final mile for victory. When it comes to romance and matters of the heart, Angel Number 44 speaks of some distance. Be it, friends, family or lovers there’s a gap that isn’t going to close easily. Negativity lingers heavily in the air along with doubts and worries. The only way to start the healing process is through adult, honest conversation followed by on-going sincere effort. The reasons for this can vary, but one key is past pains, mistakes, indiscretions, infidelity, and lies. Those require time for healing, but that’s only one part of the equation. People have to WANT things to change, meaning they’re willing to release the past, find forgiveness and then determine the best path forward. Note that the path may not be one walked together. Relationships can be seasonal, karmic or eternal. This point will determine what category things fit. Between a couple, the Angel Love Number 44 speaks of commitment but also a level of control that one or the other may not be willing to give up. That stubbornness leads to all manner of problems. If, however, you two can find a common point of agreement you have a very good chance at starting anew, appreciating each other far more for the process. For some, Angel Love Number 44 marks the end of a relationship and a period of processing. Shying away from anything too heavy is normal, just don’t say in your self-imposed seclusion forever. You need love, and you deserve it too. When you are ready to try again, your Guardian Angels await. The cornerstone of 44 in Numerology is the single digit 4, which creates firm, solid ground. There are four corners of Creation, four winds, four moon phases and four seasons (just to name a few). Putting two fours together doubles the impact of this digit’s energies which include discipline, material gains, conscientiousness, focus, awareness, business acumen, and organization. We can also reduce 44 to the single number eight by addition. Eight represents realism, symmetry, profit, accomplishment, and potential. Visually eight lying on its side becomes infinity. The number 44 is a Master Number. It’s rare in people’s lives, but when it arrives, it carries heavy implications. Angel Number 44 indicates a time of growth toward personal fullness, stability, and inner strength. Meet life with a cool mind and gentle heart. Know that you may be thrust into a position of leadership because you work well with others, maintaining a cool head. No matter what you take on, if you persevere, you will succeed. To find the number 44 in the Bible people use the value of words, letters, total numbers of verses and similar calculation. Most significantly, theologians tell us the last part of Jesus’ ministry on earth took 44 days. The number 10,000 appears 44 times in the Bible, while the number 3 appears in 44 Books of the Bible. “Tribulations” is used 44 times with 11 appearances in the Old Testament and 33 uses in the New Testament. Seeing 44 again and again – in phone numbers, addresses, magazine ads, etc. brings good news, indeed. You are in for a turn of fortune, and some of those money matters will wane. You can breathe a long-awaited sigh of relief. The Heavens have sent Angelic help that facilitates, not only abundance but also, a greater awareness of your life’s purpose. 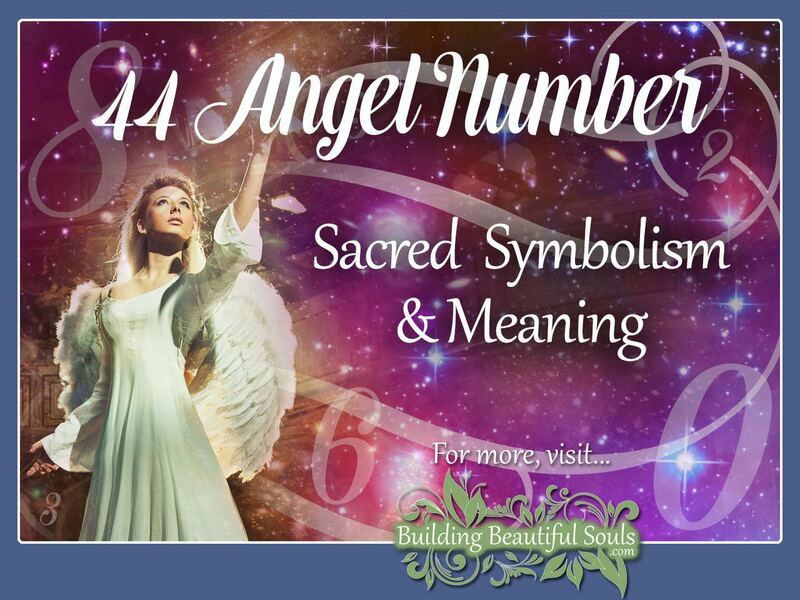 Because 44 connects with the material realm, where you see this Angel Number may have symbolic value too. If you are house hunting and keep seeing places with 44 in the street address, those might be a good place to start (for example). Don’t over-think it. If something strikes you pay attention and make note. Angel number 44 repeating itself over a period of days, weeks or even months, acts as a reminder that the good things in life don’t just stop on a dime. Something special happens regularly if you have the spiritually-aware eyes with which to see it.